Have you ever rolled out of bed, turned on the bathroom light, and stared back at yourself in the mirror utterly terrified? Where did those dark under eye circles come from!? And more importantly, how do I reduce dark circles naturally? It seems like 9 out of 10 people have dark under eye circles to some degree. I often get asked what I recommend for getting rid of them (which is funny because I have terrible dark circles), but the truth of the matter is you can’t just “get rid of them” so easily. You can however reduce the appearance of dark circles significantly if you’re diligent and know why you have them in the first place. Having hereditary dark under eye circles is the unfortunate reality for a lot of people. If your parents and grandparents have dark circles chances are, you probably have them too. People with fairer skin tones tend to have more pronounced pigmentation due to the capillaries being more visible as well as the thinness of the skin under the eye. If your dark circles are indeed hereditary, it’s going to be more difficult to lessen their appearance. The best advice I have for you is to first and foremost truly find out if your dark circles ARE hereditary. If your parents and grandparents have a history of allergies, asthma, or eczema, then there is still hope (look below for my tips)! Otherwise, your best bet is to stay hydrated (drink sole, or use electrolytes) and use cold compresses like chilled chamomile tea bags, cucumber slices, or two cold spoons held over the eyes for a few minutes each day to help reduce their appearance. Another trick is to use cold arnica cream that you keep in the fridge under the eyes. Arnica is known for its amazing anti-inflammatory properties. It’s also astringent meaning that it tightens tissues when applied topically. Using it chilled helps shrink blood vessels and reduce red and purple skin tones. It also goes without saying that you need to be eating a diet rich in nutrients like blood building minerals. Foods like black strap molasses, beets, dark leafy greens, nettles, and pastured meats will at least give your blood a more reddish hue instead of blue. Some of the best herbs for under eye dark circles are mineral rich and help oxygenate the blood like oatstraw, red clover, and chickweed. I’ve used chlorella with good results as well as it increases oxygen in the blood making you look less blue. As you get older the elasticity and thickness of the skin begins to degrade over time. This includes collagen- an essential structural protein our skin needs to help retain its thickness, smoothness, and supple appearance. This is my favorite collagen supplement to use because it not only helps with dark circles, but it also keeps your ligaments long and strong and your joints healthy. Another great collagen supplement to use is this one. Collagen is best taken as a supplement and not applied to the skin because its molecules are actually too big to do the skin any good topically. Watch out for skincare that claims that their collagen actually absorbs! Another way to keep your skin healthy, thicker, and more resilient is getting enough blood building nutrients in your body on a daily basis. It’s a commonality for the body to gradually lose its ability to fully oxygenate the blood and many people don’t absorb enough iron properly which can cause the veins to appear blueish under the skin. This of course is also true for the veins under the eyes making dark circles more prominent. If you don’t get enough good blood building minerals in your diet like iron, copper, B Vitamins, and Vitamin A, then of course these deficiencies will affect your dark circles. As I mentioned above, the other issue with aging is that it affects the ability for blood cells to carry enough oxygen throughout the body. Instead of carrying 90-100% of its oxygen capacity, blood cells may only carry half that amount. People with this problem often have cold hands and feet with blueish nails. Their lips may lack color, they may look very pale, and of course, their under eye circles will be darker in appearance. The best way to combat poor oxygen absorption is to take supplements that increase the amount of oxygen your blood cells can carry like chlorophyll, Cell Food, or ChlorOxygen. Another method to use is a roll-on blend of specific essential oils that help the blood cells “de-clump”, carry more oxygen, and circulate better throughout the tiny capillaries under the eyes. A blend like this may include frankincense, spruce, and blue tansy. 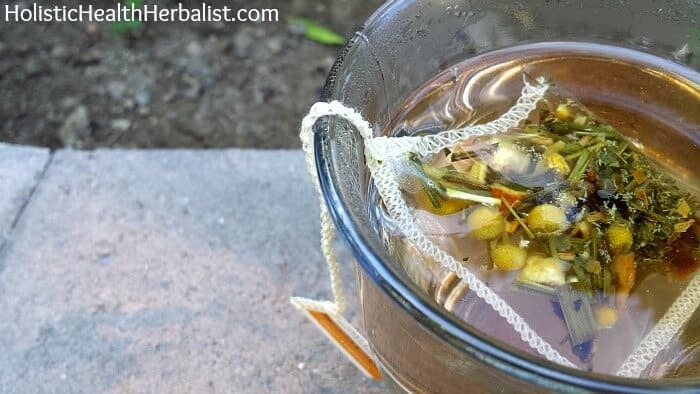 You can also learn how to make your own Valor recipe which is an excellent essential oil blend for getting the blood de-clumped and moving and may be one of the best ways to reduce dark circles naturally. These are the most common reasons why people have dark circles and it’s probably the easiest to remedy depending on your situation. I personally have both really bad allergies and asthma so you can imagine how dark my circles can be. The reason allergies and asthma cause havoc is because histamines cause the blood vessels to dilate making them more visible, especially under the eyes. The best way to remedy this situation is to find out what your triggers are. For allergies, this could be animal dander, mold, dust, pollen, grass, the chemicals you use in your house, etc. Minimizing your exposure to these things will greatly reduce your allergies and by extension reduce your dark circles as well. The same goes for asthma. Avoid what triggers it. This might be cigarette smoke, intense exercise, certain foods, pollution, etc. A lot of the time the triggers for allergies are also triggers for asthma so keep that in mind and try your best to pinpoint what makes your symptoms worse. Seasonal Allergy Blend – 3 Different Ways! • Use herbs to keep your lungs healthy like this one. 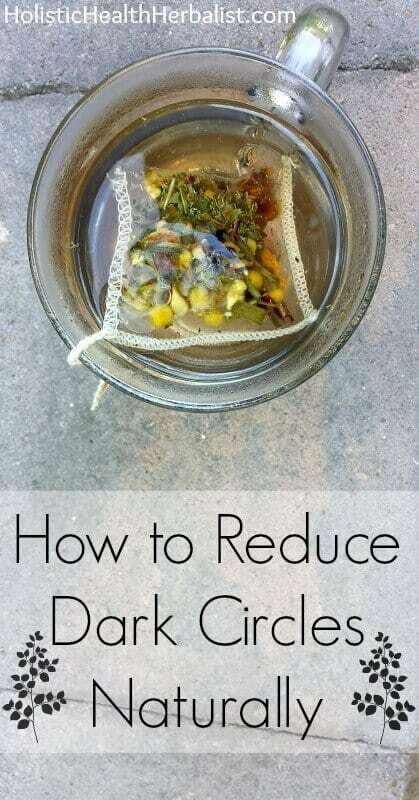 • Use herbs to reduce allergies like this and this. Depending on how diligent you are (considering that allergies and asthma are ongoing), you can expect to see a significant improvement in your under eye circles within a few days. I hope these tips are helpful! What have been your best dark circle remedies? I have developed visible blue veins under my eyes in the past few years. I get stressed and it’s not hereditary as nobody else in my family has them. What can I do? All these plastic surgeons say they cannot be gown via natural remedies..
Is there any specific thing you can recall that may be linked to the appearance of your blue veins? Finding the root cause and then going from there will be a great help 🙂 For now, you can use cool compresses on the eyes and caffeine serums to help with the blueness under your eyes. I just had a baby and he won’t let me sleep at night. I been struggling with puffy swollen eyes.. So sorry to hear about your lack of sleep! You may want to try putting chilled used tea bags on your eyes to help reduce puffiness and refresh your eyes. I find that this is incredibly soothing, and it only takes a moment to do. You may also want to try gently massaging under the undereye area to help drain fluid. Great info! Here I found some important things about dark circles. Dark circles are the common problems and these efforts can be used to treat dark circles. Thanks for sharing. Lots of great suggestions! I notice that screens at night cause all of us to have a harder time falling asleep. I have special orange glasses to filter out the blue light (which tricks the brain) if I need to read something on a screen at night. Very interesting, I knew about #3 but didn’t know much about the rest. Thanks for sharing the tips! This is so interesting. I love how you broke it up into the three causes.